what’s the different between Page Rank and Link Juice? Link juice is measured by how many relevant and high quality links a page (let’s call it “A”) receives, and how many relevant and high quality links those links that link to “A” receives, and on and on. Google is able to map out and track these linking relationships… which is what makes them… Google. This has appeared to be the most important factor in outranking your competition. Page Rank is simply Google’s unit of measurement of the authority of a page. It is NOT the same as Link Juice. 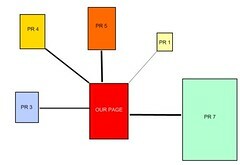 You can have 10,000 relevant links that have no PR and rank well. You can have 100 relevant links that have PR and rank well. It indicates the “weight” of a link. BOTH are important but they are not the same thing. Where to get high PR link juices? Link building is THE most time consuming process of SEO if you’re doing it right. Getting high PR links that pass potent link juices is even harder to come by… Luckily there are tools and services that can help us accomplish this. Reputable and ethical SEO consultants and companies protect their trade secrets and their clients’ privacy and do not disclose their link sources (except to their clients, of course); however, there are lots of options available, and if you simply Google “high pr links” you’ll know exactly what I mean. 1) Guest writing – Find other blogs and sites in the niche that you’re interested in and offer to write a piece of nice content to place on their sites in exchange of inserting a link or two back to the page you’d like to receive links from. You can find blogs to guest blog on at http://myblogguest.com/ and similar sites (do a search on Google). Be sure to look out for the PageRank of the blogs you’ll be posting to… the higher the PageRank and the more relevant the blogs the better. A tool that my team and I use frequently is Article Marketing Robot, which automates account creation, spinning and submission during the article syndication process and cuts down our time spent by 95%! It’s built-in article rewriter is VERY solid so take the time to learn it and use it wisely. Alrighty, that’s it for today’s tip… now go get yourself some tasty high PR link juice… and page 1 rankings!